If I dropped a china plate on a tile floor, you’d expect to see it break and shatter into a million pieces. And if I waited for hours, you would never expect the fragments to re-assemble themselves back into the plate. Even if I waited years, you’d never expect that to happen. If you knock over a glass of milk, the milk naturally flows out and disperses. It never flows back in by itself. Smoke billows from burning logs, and will never at any point consolidate back into pristine logs. And everything decays. Plants, animals, metals, monuments, landmasses, and people. We don’t age and then do a U-turn, and grow young again (with the exception of F. Scott Fitzgerald’s and Brad Pitt’s Benjamin Button). There is an irreversible direction in life and in the universe. Technically speaking, entropy is always increasing; we are constantly moving from a state of order to one of increasing disorder. Sometimes it’s more visible than at others, but wait long enough, do a “before and after” comparison, and it’s noticeable. The same is true of organizations. Wait long enough, and without corrective effort by those employed, organizations will progress from a state of order to one of disorder. Hence the presence of org charts, performance reviews, an HR handbook, managers, leaders, etc. At some level we’re aware that we need to provide structure to counter the tendency for disorder. 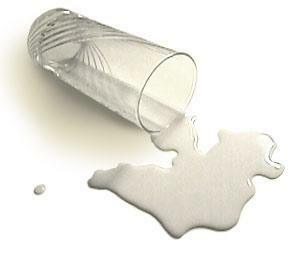 In the spilled milk example, we could get the milk back into the glass, but that would require extra effort, and considerably more effort than it took to knock the glass over in the first place. Which is at the heart of entropy. It is so much easier to add to the existing pre-disposition for disorder than to corral that disorder and bring structure to it. Case in point: Think about a team, department, company or organization you worked for that was once running well. Chances are that didn’t just happen all by itself. The milk didn’t magically flow back into the glass. It’s more likely that over a period of years, it took the combined efforts and collaboration of many people, including leaders, team members, and direct reports working together, to build this smooth running machine. Now, in the spirit of entropy, take that smooth running machine, throw in one leader who possesses the authority but not the effectiveness, and watch how the machine quickly breaks down. And it will break down much, much more quickly than it took to perfect its running well. Engaged, highly effective teams, departments, companies, and relationships can take years to build, and relative moments to destroy. All courtesy of entropy combined with less than effective leadership. Although leaders and boards of directors are very focused on identifying their high potentials, make sure you focus on possible “cry potentials” too, those individuals who if put in positions of management, leadership, or authority, might unintentionally but quickly, undermine what took years to create. As the saying goes, one shouldn’t cry over spilled milk. However, it’s much better to ensure your cry potentials aren’t given the opportunity to spill it in the first place.